Eva Gugsa and Nhu-Phuong Tran. Untitled 3D Process Model, 2018. Wood. Courtesy of the artists. Bench Mark, a Partnership for Youth exhibition, is an exploration of architecture through space, function, and purpose. Created during sixteen after-school sessions March–May 2018, this collection of works traces the design thinking process students applied while considering Seattle’s urban environment and humans’ interaction with it. Identifying the bench as focal point and unifying element of the urban environment, the ten contributing artists reveal their understanding of the many ways people use benches to interact with their surroundings. Benches offer spaces for conversation, rest, and reflection. The exhibition chronicles an experiential investigation into placemaking and how benches become the site of some of life’s most mundane as well as precious moments. Bench Mark is co-curated by Lynn Chou, Manager of Youth and School Programs, and Negarra A. Kudumu, Manager of Public Programs, featuring the work of Abdisemed Ali, Gebre Engeda, Eva Gugsa, Tegarius Kea, John Le, Kiet Nguyen, Ngoc Nguyen, Tam Nguyen, Nurham Nuru, and Nhu-Phuong Tran. Teaching artists Laura Bartunek, John Hallock, and Jim Nicholls provided instruction in design, architecture, and 3-D modeling. This youth program is organized by the Frye Art Museum with support from the Associated Recreation Council RecTech program at Yesler Community Center, Olson Kundig, and the Architecture Department at the University of Washington. Generous funding is provided by US Bank, Seattle Office of Arts & Culture, Windermere Capitol Hill, and Frye Art Museum members. In-kind support is provided by Gauge Design Group. Mike Wagner, the slings and arrows of adoration (tragic hero #1), 2018, oil on panel 57 x 48 inches. Image courtesy of Bridge Productions. This spring and early summer, Bridge Productions is excited to unveil our first Curatorial Residency featuring Negarra A. Kudumu. Throughout our 7 year history, we've often invited guest curators to take over our box sets and gallery spaces to use as laboratories for inquiry, ideas, and research. This year, we wanted to present the opportunity for an independent curator to take complete ownership of the space over time, to live in it the way we do, and see how that lived-in feeling shifts one's curatorial perspective. The inaugural Bridge Productions Curatorial Residency will host independent essayist & curator and Frye Art Museum Manager of Public Programs Negarra A. Kudumu. This residency will highlight Negarra’s ongoing intellectual and professional trajectory from neophyte art administrator to established, independent art scholar, writer, and emerging curator. Drawing from her rich repository of public talks and writings, Negarra’s residency will produce new writing on the key issues she continues to work with in her practice namely, among them the education and curation as spectrum, not a binary, curatoriality, and condition versus methodology particularly where African and African Diasporic cultural politics are concerned. To highlight and bring to bear these thought experiments, Negarra will curate an exhibition featuring new and existing works by the prolific multidisciplinary artist Mike Wagner. Through brush strokes and with refined sensibilities around what constitutes taboo, snark, and witty repartee, Mike Wagner brings the attention to the faces of the forgotten, disfigured, beautiful and unobtainable, while exposing us to both their weaknesses and our very own. A painter of true honesty, a lover of riparian entertainments and a genuine follower of his own trends, Mike Wagner paints to expose. He leaves ephemera that can, if we inculcate his offerings, illuminate our own journeys towards transformation and realization. Residing at the intersections of contemporary art, critical theory, critical historiography, and curatoriality, Negarra A. Kudumu's practice is situated squarely within the domain of cultural production and consumption. She is ever investigating the ways in which these processes are visually and discursively interpreted, with an expertise in the contemporary art of the African continent and its diaspora, and a special interest in the emerging visual culture of South Asia, and its diasporas. Negarra received her BA from Dartmouth College and her MA from Leiden University. Jaytaevius Coleman, 2017. Digital Print. MK Crenshaw, 2017. Digital Print. Neicy Petite, 2017. Digital Print. Isiah Guy, 2017. Digital Print. ALIVE Flora, Light, and Water in the Seattle Landscape, a Partnership for Youth Exhibition, is an exploration of Seattle’s urban landscape through digital photography. Created during twelve after-school sessions in March–May 2017, this collection of images showcases the city as it emerges into spring—at times blooming and verdant, at others drenched and gray. The images presented by the seven contributing artists—all local middle and high school students—reveal an appreciation for the way nature interacts with the urban environment. Their works invite us to reflect on the simple, overlooked details that the city’s seasonal scenery offers: brilliant color, shadows and reflections, the contrasts and textures of man-made and natural materials. The exhibition registers an annual cycle of beginnings, when the sky becomes a little brighter and the earth, awash with rain, produces a new season of experiences. ALIVE Flora, Light, and Water in the Seattle Landscape is organized by Negarra A. Kudumu, Manager of Public Programs, and features the work of Jaytaevius Coleman, Eleisha Cooke, Malachi Crenshaw, MK Crenshaw, Kaylia Davis, Isiah Guy, and Neicy Petite. Teaching artist Carina A. del Rosario provided instruction in digital photography, with production assistance from Adam Jabari. This program is presented by the Frye Art Museum and Associated Recreation Council RechTech program at Yesler Community Center with support from the Multimedia Resource Training Institute, Seattle Youth Violence Prevention Initiative, and Therapeutic Health Services. Funding for the program is provided by Grousemont Foundation, Seattle Office of Arts & Culture, U.S. Bank, Windermere Capitol Hill, Windermere Madison Park, and Frye Art Museum donors. Lina Iris Viktor, The Dark Continent Series, No 09, 2016. Image courtesy of Mariane Ibrahim Gallery. Back Stories is as much a celebration of the human form as it is an investigation into the ways in which these artists feel the body, particularly the back, can be used to tell a story. They investigate the back both as its own entity and also as an integral part of the human body. These rear views present the back in all its mystery, secrecy, defiance, and splendor that is the gateway through which we engage with the totality of the lived, bodily experience. This exhibition was co-curated by Negarra A. Kudumu. Abdisemed Ali. The Reflection, 2016. Image courtesy of artist. Ryo Nguyen. Blinded: learning to speak white, 2016. Image courtesy of artist. Zaidaan Shibuya. Moment, 2016. Image courtesy of artist. Those Without Voice—a Partnership for Youth Exhibition presented by the Associated Recreation Council RecTech Program at Yesler Community Center and the Frye Art Museum—is an exploration of sight and perspective. Created by youth and interpreted through photography and video, this exhibition comprises an array of images that reflect on what constitutes art, offer alternative visions of urban life, and acknowledge the blind eye that society turns towards injustice. In bringing a renewed lens and complexity of thought to this unified theme, the student artists affirm the diversity and strength of young people’s world view, while also asking the viewer to consider the dynamics of power associated with vision and perception. The works, developed over the course of fourteen after-school sessions, represent a display of informed and intentional agency. The students created photographic and video works reflecting issues of importance to them. Through this creative process, they acquired professional design and production skills, and refined their abilities to discern and critique their social environment. Those Without Voice was organized by Negarra A. Kudumu, Manager of Public Programs, and features the work of Filsan Abdisatar, Asma Adam, Abdisemed Ali, Gebre Engeda, Angel Hadnot, Beza Hailu, Ryo Nguyen, Emran Nuru, and Zaidaan Shibuya. Teaching artist Derek Edamura provided instruction in digital photography and video production. Those Without Voice is a 2016 Frye Art Museum/Yesler Community Center: Partnership for Youth program funded by the Frye Foundation, Seattle Office of Arts & Culture, the Associated Recreation Council, US Bank, and Frye members and supporters. Zahra Siddiqui, Badshah and Malka #3, 2016. Image courtesy of Negarra A. Kudumu. Zahra Siddiqui, Badshah and Malka #5. (2016). Image courtesy of Negarra A. Kudumu. The Invisible Majority is the first solo exhibition of Toronto-based, South Asian photographer, documenter and visual artist, Zahra Siddiqui. Siddiqui was born and raised in Toronto but has worked in the United States and the Caribbean, where over the past five years her photography career has blossomed. Core to Siddiqui’s practice is mindfulness and working from this point of departure is what allows her to tease out the intrinsic, aesthetic value within her subjects. In a time where people of colour are increasingly maligned, the beauty that Siddiqui captures stands in stark contrast to a single, problematic narrative. Where the status quo paints people of color as aggressive and marginalized, Siddiqui portraits have a transformative power, which demands our respect and reverence for her subjects. The work on display in this exhibition constitutes a small portion of the artist’s oeuvre to-date, but stands in tribute to the communities of people who constitute home for Siddiqui, no matter where they are: New York City, or Trinidad & Tobago. Toronto holds special significance, in part because it is Siddiqui’s hometown, but also because of its position as one of the most multicultural cities in the world. Siddiqui’s work connects us to the actual composition of this multicultural metropolis, thus distilling a grand pronouncement into an intimate, visual narrative. Organized by Artscape, and conceived of by curator Elle Aconcel with guest curator Negarra A. Kudumu, this exhibition is a celebration of community, but moreover an exaltation of the diverse hues of melanated people. MWANGI HUTTER: black, red, gold? The human body – mostly one's own - is often the starting point of the work of Mwangi Hutter. The artist couple has created a collective identity that raises questions about the perception of gender, culture, ethnicity and social distinctions. For the Kunsthalle Mannheim, Mwangi Hutter are developing a three-channel video installation with sculpture that juxtaposes dynamic movement and menacing solidification. The work "Black, Red, Gold?" (2018/2019) refers to the euphoria and to the rhythm of dance. Also, it shows the body as a sensitive shell, whose skin color gives off a projection surface for demarcation and prejudice. Visible and hidden, undefined sexuality and uncanny desire, silence and powerful melodies come together in the installation. Atlantica is a compilation of essays and a curated photo book which presents art from after the independence, and presents the work of different artists from Angola, and its Diasporas. Atlantica is a term that both evokes a fictional geographical location from classical mythology that stands for an idea of Exile , but also refers to the atlantic sea fluxes that gave rise to all cross polarizations that characterized the visual practices from these regions. The tension and conflicts that characterized the political, social and economic realities of Lusophone Africa after the independence in the last 40 years, gave expression to a new generation of artists that emerged from an unique expression out of tension and disquiet permeating their past and present realities. Promoting the cultural exchange, which will culminate in the publication of a compilation of three photographic books with theoretical essays, contributing to the internationalization of the represented artists. Let Them Enter Dancing and Showing Their Faces spans the multiple generations and forms of media that inform Nicholas Galanin’s “vessels of knowledge, culture and technology—inherently political, generous, unflinching, and poetic.” He creates and speaks through multiple visual, audible, and tactile languages, a practice succinctly articulated through the introduction by artist Merritt Johnson, and further explored in conversation and critical analysis through scholars Negarra A. Kudumu and Erin Joyce. For Nep Sidhu, art-making is a form of ritual, a means of protection, and a profound affirmation of inner life. This catalogue accompanies Nep Sidhu's 2016 solo exhibition at Surrey Art Gallery, Shadows in the Major Seventh. It includes an introduction to the exhibition by curator Jordan Strom, an essay by critic Negarra A. Kudumu, and an interview with the artist about his Paradise Sportif clothing line by writer Manjot Bains. The publicationalso includes high-resolution photographs of each work in the exhibition, along with a list of works. Recent Histories: Contemporary African Photography and Video Art from The Walther Collection unites the perspectives of 14 contemporary artists of African descent, who investigate social identity, questions of belonging, and an array of sociopolitical concerns—including migration, lineage, the legacies of colonialism and Calvinism, and local custom—as well as personal experiences in Africa and the African diaspora. Co-edited by Michelle Dunn Marsh and Negarra A. Kudumu, All Power: Visual Legacies of the Black Panther Party is a 96-page, illustrated volume including works by artists Derrick Adams, Maikoiyo Alley-Barnes, Endia Beal, Bruce Bennette, Yadesa Bojia, Howard Cash, Emory Douglas, Ayana V. Jackson, Njena Jarvis, Paul Rucker, Kambui Olujimi, Lewis Watts, Carrie Mae Weems, Mickalene Thomas, Hank Willis Thomas, and Robert Wade. 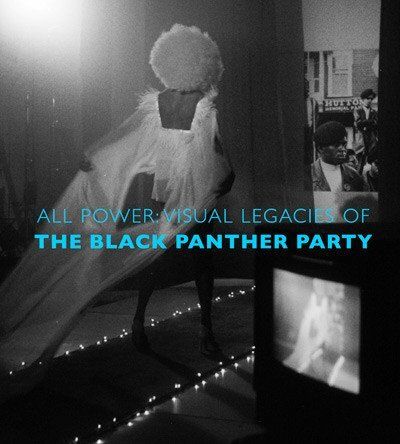 The book also includes an interview of Hank Thomas conducted by Deborah Willis, PhD, Chair of the Department of Photography and Imaging at New York University's Tisch School of the Arts, and an essay by René de Guzman, Curator at the Oakland Museum of California, who organized the museum's exhibition, All Power: Black Panthers at 50. Published by Minor Matters Books, Seattle, WA (2016). Mad Vibrations: A Humming Ritual for Untrustworthy Narrators by Amal Alhaag and Maria Guggenbichler, District (Berlin, DE),October 20, 2018. Click to access opening and closing meditations.